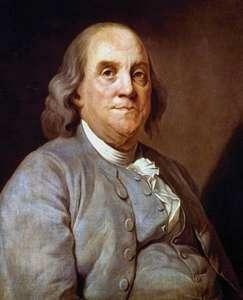 January 17, 2019 -- Benjamin Franklin, American printer and publisher, author, inventor and scientist, and diplomat. One of the foremost of the Founding Fathers, Franklin helped draft the Declaration of Independence and was one of its signers, represented the United States in France during the American Revolution, and was a delegate to the Constitutional Convention. He made important contributions to science, especially in the understanding of electricity, and is remembered for the wit, wisdom, and elegance of his writing.